Welcome to the Fit Small Business Xero training course! In this lesson, we’re going to cover how to set up products and services in Xero. Why Is It Important to Set up Products and Services? One of the benefits of using an accounting software program like Xero is the amount of time it will save you when it comes to managing your day to day business operations. Unless the products that you sell are custom made for each customer, you will generally have a list of core products and services that you sell to your customers. By taking the time to set up your products and services in Xero, you will be able to create invoices, purchase orders and other forms in a few short minutes. Instead of having to type out each product or service on the form, you will be able to make your selections from a drop down list. For the purposes of this lesson, we will discuss how to enter inventory items individually into Xero. However, if you are converting from another accounting software program and you have a lot of items, you can import them into Xero from a CSV (Excel) file. Head over to our How to Import Products and Services lesson for step by step instructions on how to do this. There are two ways to set up inventory in Xero. First off, if you sell products or services that you do not need to keep track of the quantity and cost for, those items will be set up as untracked inventory. For example, any kind of service such as consulting or bookkeeping services would be considered untracked inventory. On the other hand, products that you need to keep track of the cost and quantity purchased and sold will need to be set up as tracked inventory. For example, if you purchase cases of water that you turn around and resell to your customers, then you should keep track of what you paid for the water as well as how much you sell the water for; this will allow you to run reports so that you can gain a better understanding of your sales and profit margin. Whether setting up untracked inventory or tracked inventory items, the steps are exactly the same. 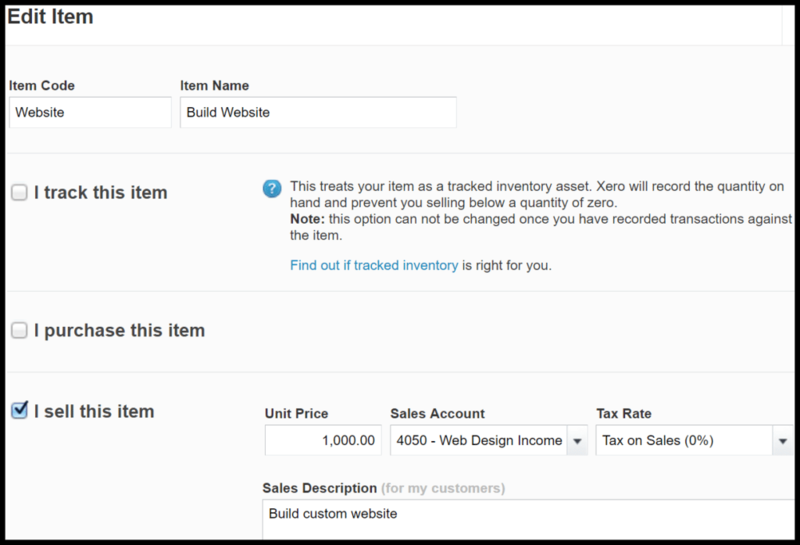 Next, we will walk through how to set up inventory items in Xero. Follow the steps below to add a new inventory item to Xero. From the the Accounts menu, select Inventory as indicated in the screenshot below. Click the “New Item” button as indicated in the screenshot below. There are several fields that you need to complete in order to set up a new item. A brief description of what to include in each field along with a screenshot is below. New Inventory Item Set up in Xero. Set up your items so that you can quickly create invoices, purchase orders and other forms. Item Code – A unique code (up to 30 characters long) should be assigned to each item so that you can easily find it. For example, if your items have an SKU, ISBN or UPC code, use this number as your item code. For services, you could use a shorter version of the item name, as we have done in this example. Item Name – A description that tells you exactly what the item is should be included here. This field can be up to 50 characters long. I track this item – If you are setting up a product that you need to track quantity and cost for, select this option. 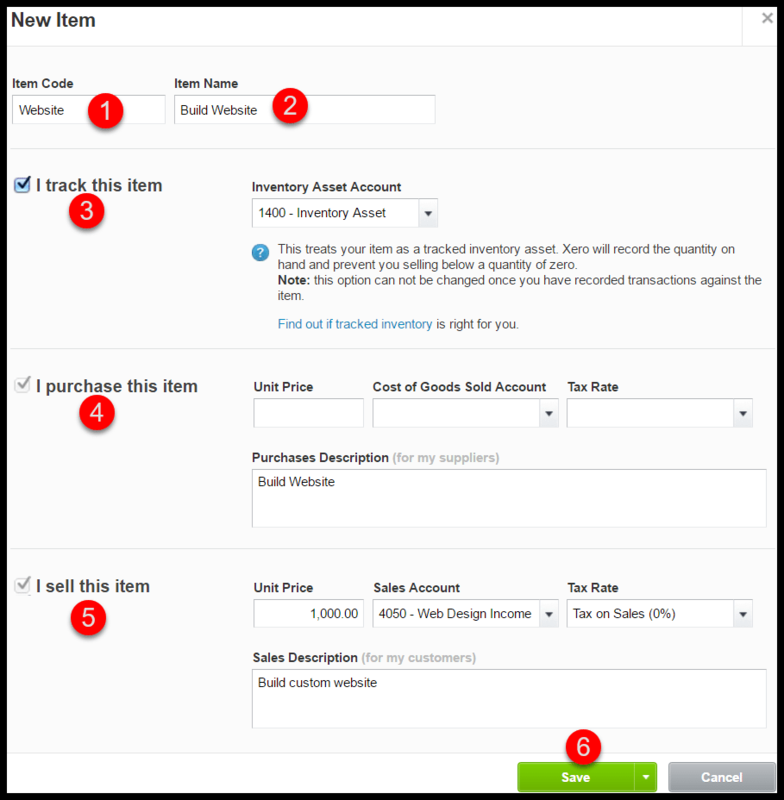 Once selected, the account field will display to the right which will show the account that will be used to track the item for accounting purposes: “Inventory Asset.” If you are setting up a service or product that you do not need to track quantity and cost for, do not check this box. NOTE: As indicated in the above screenshot, once you have posted transactions to an inventory item that you are tracking, you cannot make any changes to the Inventory Asset Account. I purchase this item – If the item that you are setting up is a product that you purchase from a supplier and you want to keep track of the quantity and the cost of those purchases, select this option. Enter the unit price, select the account in the cost of goods sold field and enter the description of the item and select the appropriate sales tax rate from the drop down field. This information will help you to quickly populate purchase orders that you create and send to suppliers. Keep in mind that you can always change this on a per transaction basis. I sell this item – If you sell this item to customers, you will need to enter the sales price (unit price), the sales account you want to track the income, the tax rate and a brief description that you want to appear on quotes, invoices and receipts that you send to customers. Save – Be sure to save your changes. While the steps to edit an inventory item are a piece of cake, there are some restrictions on what can and cannot be changed for both tracked and untracked inventory items. Let’s discuss the limitations first and then we will walk through how to make changes. For both tracked and untracked inventory items, if you change the item code, it will flow through to existing transactions, quotes and purchase orders that use that inventory item. For both tracked and untracked inventory items, if you change any field (other than the item code) it will only affect future transactions, quotes and purchase orders that use that inventory item. You can convert an untracked item to a tracked item. Additional info on how this works can be found here. For tracked inventory items, you cannot deselect the I purchase this item or I sell this item checkbox. A tracked item cannot be converted to an untracked item. Therefore, we suggest that you set up a brand new item if you need to “untrack” an existing inventory item. Follow these steps to edit an inventory item. Click the Item code as indicated below to select the item that you would like to edit. The item information will display on your screen. Click the “Edit Item” button as indicated below. NOTE: At the bottom of the screen you will notice a section called Recent Transactions. Any recent transactions such as invoices, credit notes and purchase orders that included this item will be listed here. This is a way to quickly see the recent activity for this item without having to run a report. You can make changes to any field that is not grayed out. Once you have made all of the necessary changes, be sure to save your work. Edit an Inventory Item that was previously set up. In this screen, you can make changes to tracked and untracked items as needed. When it comes to deleting anything in an accounting software, the rule of thumb is generally that you should not do it. The primary reason for this is to ensure that historical information remains intact. Similar to editing inventory items there are limits on what inventory items can be deleted. Most of the limitations apply to tracked inventory because of the impact on cost of goods sold and the inventory value. If it’s been used on an approved invoice or an approved bill. One of the many features that makes Xero stand out ahead of its competitors is the ability to assign a role with specific permissions to a user. Depending on user permissions, you can set up employees who can only create transactions and you (or someone else) must approve them. You will learn how user permissions work in the How to Invite Users lesson. If it’s been used in a spend money or receive money transaction. A spend money or receive money transaction is when you pay for something (spend) or receive money (receive) like picking up lunch for the office or receiving a rewards check from your credit card company. You’ve added an opening balance to it. You’ve made an adjustment to it. You can’t delete a tracked or untracked inventory item if it is used on a recurring invoice or bill; however, you can remove the item from the repeating (recurring) invoice or bill and then delete the item. Step by step instructions on how to do this can be found here. Follow these steps to delete an inventory item. In the upper right hand corner, click on the “Options” button and select Delete as indicated in the screenshot below. How to Delete an Inventory Item – This will allow you to delete any item that has not been previously used in a transaction. From this screen, you can confirm that you want to delete the account by clicking the “delete” button or you can cancel if you have changed your mind. Note: Please understand that once you click the Delete button there is no Undo button. If you realize later on that you need an inventory item that you have deleted, you will have to add it back to your inventory item list. Note: We recommend you make an inventory item inactive before deleting. If you have an inventory item that you no longer plan to use but you cannot delete it because it has been used in a transaction, then you can make it inactive. You can mark tracked and untracked inventory items as inactive. 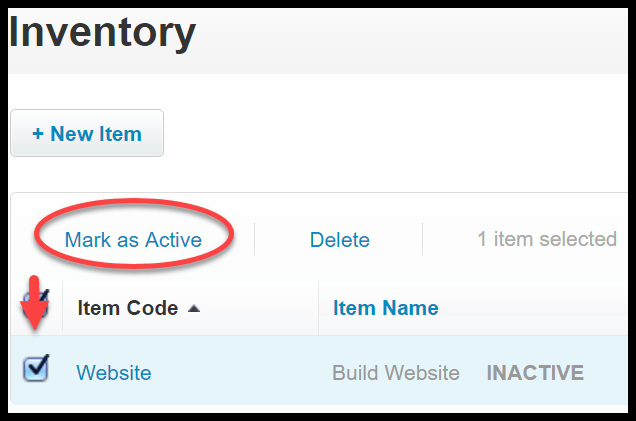 Follow these steps to make an inventory item inactive. The item information will display on your screen. Click the “Options” button and select Mark as Inactive as indicated below. Make an Inventory Item Inactive in Xero. This option can be used to remove an item from a list (but not from Xero). Great alternative if you cannot delete the item because it has been used in a transaction. Note: Items that have been marked as Inactive will still display on your item list with Inactive in the item name. If you need to start using an inventory item that you previously marked as inactive, you can easily make this change by following the steps outlined below. In the Inventory Items list, put a checkmark to the left of the item that you want to activate and you will see Mark as Active option pop up. NOTE: You will not see the Mark As Active option until you put a checkmark next to the item as indicated in the screenshot below. Make an Item Active in Xero – you can activate an inventory item that was previously made inactive. Once you mark the item as active, the following message will display. Another benefit of keeping track of your products and services in Xero is that you will have access to reports that will give you insight into your cost, quantities and sales of all inventory items. Follow the steps below to navigate to the Inventory reports. On this screen, you will see the list of reports available. There are a total of 5 reports listed here; 2 older reports and 3 new and improved reports. For the purposes of this lesson, we will focus on the 3 New reports. The “New” reports are part of Xero’s recently updated reporting package that feature greater customization. We will discuss this in more detail in our Reporting in Xero course. Below, you will see a brief description of each report along with an example of the report. The Inventory Item Summary report shows all tracked, untracked, active and inactive inventory items for a period of time. 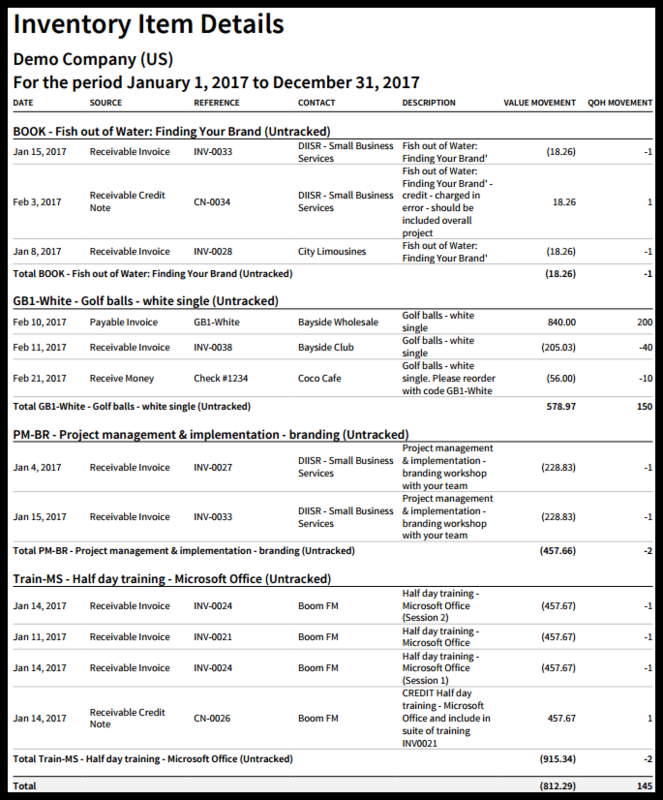 This report will show opening and closing balances, purchases, sales, inventory adjustments and profit for all items. Below is a sample report. Inventory Item Summary Report in Xero. 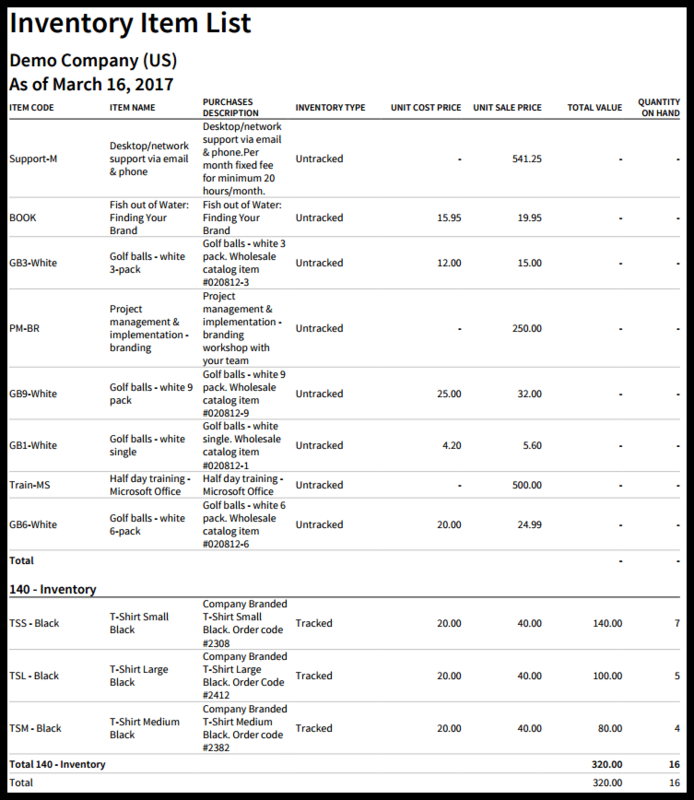 This report will show the balances, total purchases, sales, inventory adjustments and profit for all inventory items. The Inventory Item Details report shows the quantities on hand and changes to the value for all active inventory items. This report will not show any items that you have made inactive or that have been deleted. Below is a sample report. Inventory Item Details Report in Xero. This report shows all quantities on hand and value changes for all active inventory items. The Inventory Item List report shows the total quantity and value for all tracked inventory on hand. Below is a sample report report. Inventory Item List Report in Xero. This report shows the quantity and value for all tracked inventory items on hand. That wraps up the section on how to set up products and services. The next lesson in our Xero Training Course will be how to import products and services. In this lesson, we will walk you through how to take your existing list of inventory items and import them into Xero. To access this lesson or any of the others in the series, click here. For a free 30-day trial of Xero, click the button below.